Oven thermometer. Since most oven temperatures vary from top to bottom and side to side, place an oven thermometer next to food while cooking to ensure proper temperatures. Measures oven temperature ranges from 150°F to 600°F. 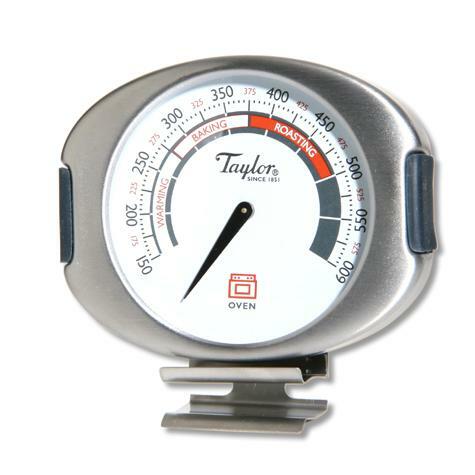 Large 3-1/2" thermometer head with a 2-1/2" viewing dial for easy reading. Stainless steel construction with silicone grips for safe and easy handling. Three-position alignment allows the thermometer to hang, stand, or clip to an oven rack.